BEVERLY HILLS, CA; July 22, 2014 -- Ken Burns’s upcoming film, THE ROOSEVELTS: AN INTIMATE HISTORY, marks the first time the Roosevelts’ individual stories have been woven into a single narrative, following the family’s story for more than a century, from Theodore’s birth in 1858 to Eleanor’s death in 1962. Over the course of those years, Theodore would become the 26th president of the United States and his beloved niece, Eleanor, would marry her fifth cousin, Franklin, who became the 32nd president. Together, they redefined the relationship Americans had with their government and with each other, and redefined, as well, the role of the United States within the wider world. The first 2-hour episode will premiere on PBS stations, Sunday, September 14th (8:00 p.m. ET) and the entire series can be streamed on station websites and PBS station branded digital sites beginning the day after the broadcast premiere. THE ROOSEVELTS is written by long-time Burns collaborator Geoffrey C. Ward, who is an authority on Franklin Roosevelt. The author of two biographical volumes, A First-Class Temperament and Before the Trumpet, he is also the editor of Closest Companion, which revealed for the first time Roosevelt’s close friendship with his distant cousin, Daisy Suckley. Ward’s interest in FDR grew in part from the fact that he, like FDR, is a polio survivor. 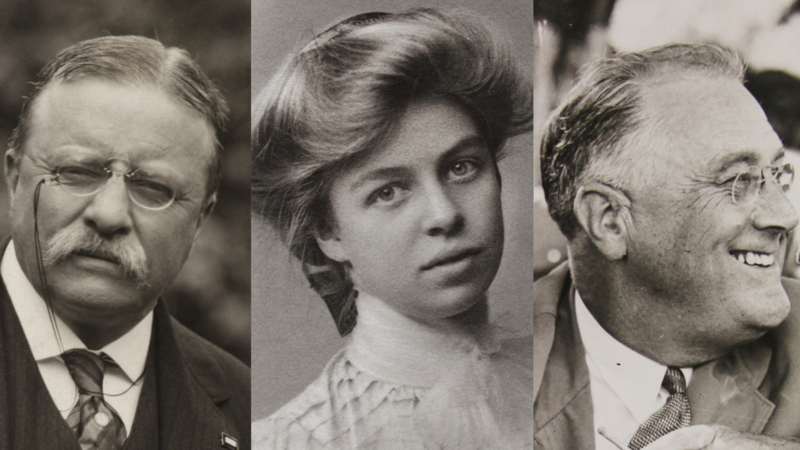 The first episode of THE ROOSEVELTS will premiere on Sunday, September 14th from 8:00 to 10:00 p.m. (ET) and run for seven consecutive nights. In addition, each episode will be repeated from 10:00 p.m. to 12:00 a.m. (ET) each night and will have a weekend, daytime marathon September 20th and 21st. An additional repeat is planned in spring 2015. Beginning on Monday, September 15th, the entire 14 hours will be available online to stream through PBS stations’ video sites, pbs.org/theroosevelts, and PBS station branded digital platforms, including, ROKU, Apple TV and Xbox, and will be available for two weeks, through September 29th. To support the film, WETA, the Washington, D.C. public television station that produces Burns’s films, in partnership with PBS and others, will create an ambitious educational engagement campaign that utilizes the stories of the Roosevelts to engage students — and all Americans — in better understanding some of the most critical periods of history of the 20th century. THE ROOSEVELTS will also be available on DVD and Blu-ray September 16, 2014. The DVD and Blu-ray include special features — 13 bonus videos, making of THE ROOSEVELTS and deleted scenes with an introduction by Ken Burns. This film will also be available for digital download on iTunes, Amazon, GooglePlay, Vudu, Xbox, Target Ticket and Nook. Funding is provided by Bank of America; Corporation for Public Broadcasting; Mr. Jack C. Taylor; The Arthur Vining Davis Foundations; National Endowment for the Humanities; Rosalind P. Walter; Public Broadcasting Service and members of The Better Angels Society, including Jessica & John Fullerton; The Pfeil Foundation – David, Mindy, Robert & Daniel Pfeil; Joan Wellhouse Newton; Bonnie & Tom McCloskey; and The Golkin Family. WETA Washington, DC, is the third-largest producing station for public television. WETA’s other productions and co-productions include PBS NEWSHOUR, WASHINGTON WEEK WITH GWEN IFILL, THE KENNEDY CENTER MARK TWAIN PRIZE, IN PERFORMANCE AT THE WHITE HOUSE, THE LIBRARY OF CONGRESS GERSHWIN PRIZE FOR POPULAR SONG and documentaries by filmmaker Ken Burns, including THE CIVIL WAR, THE WAR, THE NATIONAL PARKS: AMERICA’S BEST IDEA, THE TENTH INNING and PROHIBITION. More information on WETA and its programs and services is available at www.weta.org.